This is the only fuel card designed exclusively for professional contractors. It’s built to save you money on fuel, maintenance, and building materials while helping organize your fleet maintenance. Save time with a single solution that's accepted for all of your fuel, maintenance and supply purchasing needs. Our mobile app, FleetAdvance, helps you and your employees find the cheapest fuel sites in your area.† Monitor transactions and manage your account online in real time. Download detailed reports anytime. Save time with a single solution that’s accepted for all of your fuel and maintenance purchasing needs. Eliminate the hassle of searching for accepting sites. Accepted anywhere Mastercard® is accepted for fuel and maintenance. That includes 160,000 fuel locations, 400,000 maintenance locations, and more than 12,000 home improvement retailers and building material outlets nationwide. Start saving money for your fleet business today by choosing the right one. Fleet managers can save anywhere between 10-15% when selecting a fuel management solution. Just answer a few questions about your fleet and one of our experts will recommend the right fleet card program tailored to fit your business needs. †The FleetAdvance mobile application and usage come free with your program enrollment. The FleetAdvance web application is free for the first 60 days. After 60 days, a monthly service charge will be billed to your account. To unsubscribe, call your Customer Support number. *Earn an average discount of 2-3¢ per gallon based on specific locations within the Retail Savings Network. Purchases must be made with the BuilderPro Comdata Universal FleetCard Mastercard® and the account must be in good standing. Not valid on aviation, bulk fuel, propane or natural gas purchases. The Retail Savings Network is a selected group of fuel locations that allow cardholders additional savings. Program pricing re-evaluated annually and subject to change. **Earn a 5% rebate each month on all eligible purchases made at select large big box home improvement retailers, including Home Depot, Lowe’s, Menards, and HD Supply. Cardholders can earn up to $1,200 cash back annually, capped at $100 per month. Rebate credited to account statement monthly in arrears. Rebates are subject to forfeiture for inactivity or if account is not in good standing. Qualifying purchases do not include purchases or reloading of prepaid cards, or purchases of other cash equivalents. Purchases made at warehouse clubs, supercenters or department stores are not permitted. Program pricing is re-evaluated annually and subject to change. ***5% rebate on purchases at Firestone and Tires Plus Retail Locations is available through the Mastercard® Easy Savings Network. Rebate will be applied after the time of transaction. The Easy Savings Network is a Mastercard® funded program that is subject to change without prior notice. ©2016. 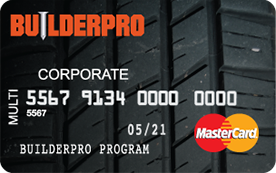 BuilderPro Comdata Universal FleetCard Mastercard®. The BuilderPro Comdata Universal FleetCard Mastercard® is issued by Regions Bank, pursuant to a license by Mastercard® International Incorporated. Mastercard® and the Mastercard® brand mark have registered trademarks of Mastercard® International Incorporated. Program Terms and Conditions apply. Visit www.builderprocard.com/terms for details. Fees may apply in some cases, such as for optional services, late payments and/or credit risk.